I bet you surely have heard of Google Analytics and possibly even use it as a basic tool for counting traffic to your site! Also, we can bet that you do not use much of its ability and difficulty in interpreting the statistics of traffic sources, consumer behavior and conversion of these. Well, we're here to help you as an experienced Internet advertisers and marketers! Strategic business decisions must hold upon accurate data rather than guesswork or instinct. You need to know how visitors find your site and what are the sources of user traffic, which eventually convert to purchase, download, registration, call or other desired action. In addition, you should know how much the acquisition of any visitor, whether by paid advertising or other marketing campaign. 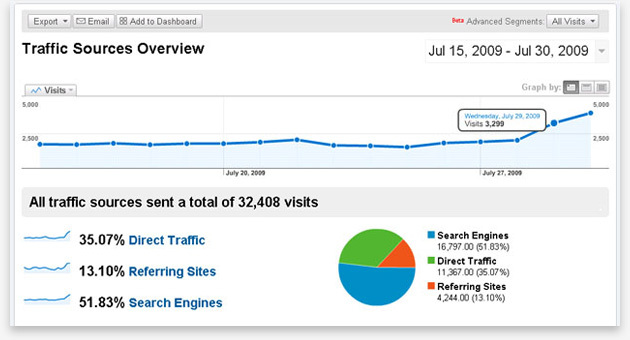 With Google Analytics you will make good marketing decisions, leading to higher return of investments. customizable reports combined with selected information that you want to analyze. individual training to learn the hidden techniques and skills.